Have you ever lost your keys, only to find them later in the fridge? Maybe you’ve walked all around the house looking for your phone, only to realize that you’re talking to someone on it? Yeah. We ALL make these kinds of stupid mistakes. But there are also some really common stupid mistakes that we tend to make in the polymer clay studio, too. Here are some that come to mind. Most of which I am sharing from personal experience! How many of these are you guilty of? Are there other bone-head mistakes that you’ve done aside from these? Tell me about them in comments! So you’re deep in concentration, happily applying mica powder to your creations with a little brush. You want to make sure that you get it placed perfectly. You’re almost done, so you’re sort of ignoring a little tickle in your nose. But it becomes too much and you’re hit with a huge sneeze and don’t even have time to turn your head. Boom. Next thing you know, the air is sparkling and you are looking at spatters of powder all over your work surface. Not that I’ve had this happen or anything. Believe it or not, this is one of the reasons I use plain copy paper as work surface when applying mica powder. Because you can just pick up the paper and pour the spilled mica back into the jar. Sneezed-on Pearl-Ex is annoying but not a terribly stupid mistake. But this one is. You know better. But you do it anyway! You think, “Oh, I just want to test this texture sheet real quick, the clay won’t stick.” But it does, and you stand there just rolling your eyes at yourself as you wad up your clay and use it to pull out the stuck bits. Just like when you get gum stuck on your fingers. (Yeah, you knew better on that one, too.) Doh! Make it easy on yourself. Always use a mold release when using texture sheets and mold. What’s a mold release? Well, the simplest is to use a spritz of plain water on your texture sheet. You can also use a very light dusting of cornstarch (cornflour). Another great mold release is Armor-All or Son-of-a-Gun, which are leather conditioning sprays used to keep car interiors shiny. If you use one of these though, then the next stupid mistake is for you! Armor-All and Son-of-a-Gun are great when used as a mold release. They contain a “slickening” agent called dimethicone (silicone oil) that makes a surface non-stick and slippery feeling. It’s also used in anti-tangle treatments to make hair feel silky smooth. As you can imagine, this makes a great substance to be sprayed onto a texture sheet or mold to keep the clay from sticking. But be very careful that you’re not holding the texture sheet over the floor while you spray. If you do, the overspray will coat the floor, making it slippery. Yes, I found this out the hard way as I sailed into my studio one day wearing my fuzzy slippers. I sailed a little faster than I expected! If you have a motor for your pasta machine and long hair, please pull your hair back when you use it! Visualize this for a moment. You’re sitting there conditioning some clay, in a hurry because you’re impatient to see how something will work. And between machine passes, you drop your clay on the floor. So you bend over, reach down and pick it up real quick. But think for a moment how close your hair comes to that pasta machine as you bend over. Are you cringing yet? Yeah, that would be quite a disaster! No, I haven’t done this and I don’t know anyone who has. But I want to make sure you’re not the first. Okay? Tie your hair back! Maybe it’s time to make some cool barrettes? The long polymer clay slicing blades have one dull side and one sharp side. But you can’t always see the difference when you’re working fast and concentrating on your work. You arrange your blade in just the right place and press down to cut your clay. Then you realize your mistake; the blade was upside down. I think most of us have done this stupid mistake a few times (at least). If your blade is super sharp, you can cut yourself quite badly. At the very least, you end up using the dull side of your blade to cut and that doesn’t do a very good job! To prevent this potentially dangerous mistake, many clayers apply bits of baked clay to the top corners of their blade so they always know which side goes up. The Nu-Blade by Kato comes with little handles on each end that serve the same purpose. Personally, I just prefer to use a dull blade for my general clay work. I only use sharp tissue blades when I’m actually slicing canes or shaving mokume gane or mica shift. By the way, if you’re claying with children and want them to use a blade that is completely safe, check out the LC Blade for Kids by Lucy Tools. In comments, Brenda told us that she paints the dull edge of her blade with bright nail polish. That way it’s visible but doesn’t get in the way of making slices. Brilliant!! This is likely more common for US clayers than for people elsewhere because of a simple (and annoying) coincidence. We bake our clay (Sculpey brands) at 275°F, but since we first learned to bake cookies and put frozen casseroles in the oven, we have known to set the dial to 375°F. It’s just simple muscle memory. We can’t help ourselves. It’s like putting the car into gear when we want to drive…it just happens. So if you’re distracted, it’s super easy to turn your oven’s dial to 375°F and put the clay inside. Of course the result is a disastrous smoky black mess. But the lesson is clear. Take a moment to double-check that you really did set the oven temperature where you intended to! This is related to #6, but luckily it doesn’t have the same choke-inducing results. You turn on your oven, set the temperature, wait for it to preheat, then put your clay inside. You then go find your phone so you can set the timer and relax for 30 minutes with a cold drink while your clay bakes. But then you go on Facebook. And you get a phone call. And then the doorbell rings. Life happens. If you’re lucky, it dawns on you before too long that you never set the silly timer and you have no idea how long the clay has been in the oven! If you’re unlucky, you don’t realize this until you go to your clay oven the next day and find that it’s still baking your clay. Yikes! Yeah. Set the timer next time. As an aside, as long as your oven’s temperature is correct, even baking overnight will not burn your clay creations. The color may darken, but it will still be functionally just fine and may even be super strong! Time for a little confession. My husband drives me nuts sometimes. I love him dearly, but he’s the type of person to set the lid ON the bottle of salad dressing, but not actually screw it down. So I come along after dinner and pick up the bottle to put it away. But I pick it up by the lid and the bottle crashes to the floor, splashing ranch dressing all over the kitchen. If you have the same tendency as my husband, don’t make this mistake with alcohol ink bottles! I’m sure you can imagine the colorful results of this particular mistake. Always double-check that your lids are on tight, especially if you store your bottles on their sides. Speaking of alcohol ink, have you ever noticed how excess ink always runs down the spout? Even if you wipe it off before putting on the cap, there always seems to be dried alcohol ink around the cap. This tends to fall away as little dark specks of dried ink. Make sure you always open your bottles over a trash can or at least away from your clay. These little specks of ink will be dissolved by the oils and plasticizer in polymer clay and the ink can stain unwanted areas on your clay. If you ever have errant specks of color that show up days later on your clay, this is likely your culprit. Have you ever brushed sealer on your project and were so focused on carefully setting it up to dry (and admiring your beautiful handiwork) that you forgot to clean the brush? You come back the next day and it’s stiff as a board. I do this all the time. Do you have to throw the brush away? Actually, no. Just soak the brush in a little cup of rubbing alcohol (isopropyl alcohol). 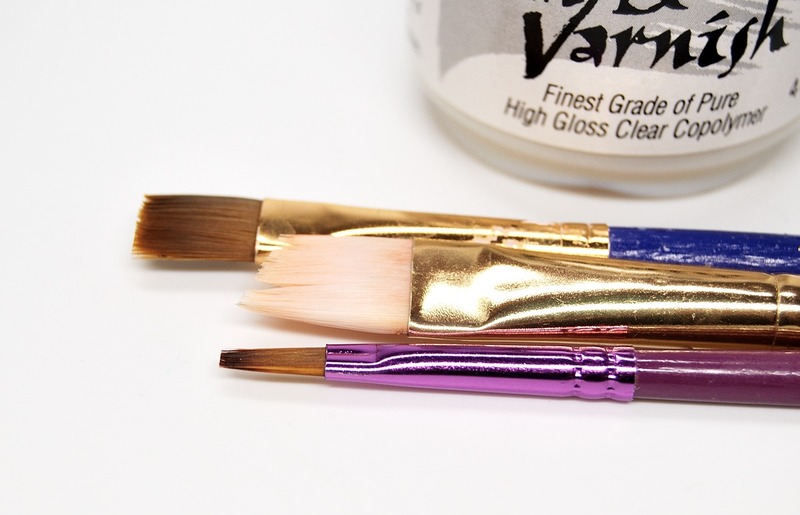 It will take about 30 minutes, and maybe some coaxing, but the sealer will soften up and you can then wash your brush as normal. I’ve had a little bit of fun here, making light of the fact that we all make silly (and stupid) mistakes. We are human. But don’t think for a minute this means you shouldn’t be asking questions and learning how to do things better. It’s okay if you’re new at something or don’t understand how something works. It’s okay to make mistakes. And the only stupid question is the one not asked. At the top of every page of this website is a search box. It works really well for finding the articles that have answers to your questions. Ask it something. Give it a try! Another good place to ask questions is Google. Just type in your question. I love using voice search, too. It will often give you the answer right out loud. If you’re on Android and have voice search set up, try asking your phone, “OK Google, can you use eye shadow with polymer clay?” Go on…try it. I’ll wait. Isn’t that cool? You can bet I made everyone I know try that when I first found it. I wanted to create my own mica powder…. there was enough left in the toner box of the copy machine, though it wasn’t enough for copying. So I opened the toner box and was going to “carefully” put the toner into an empty tin. My back yard turned magenta………. Forgetting to put the plastic plunger in your Czextruder after you have loaded it with clay and grind the threaded rod into clay instead of pushing the clay out of the disc hole. Aside from wasting a nice stacked log of color clay circles ,cleaning the threaded rod is quite a chore. The CZ extruder? Oh yes, been there done that. Never want to do it again! I’ve done that…but luckily haven’t done it when I would ruin a carefully stacked plug of clay. And yes, it’s Czextruder…as in Czech Extruder…Czextruder (Checkstruder!) The BEST extruder on the market. Of the above, I’d say using my blade dull side down is the most common. It’s a drag! In case you ever wondered what would happen if you spilled a container of Pearl Ex on your suede clogs, it’s not pretty (although it is sparkly). I restored the floor (tile — whew! ), the clogs … not so much. Forgetting that you set some excess clay on plastic that was not “safe”. I did this so many times until I made a conscious effort. Ruined lots of plastic bins, lids, folders…ugh! I once dropped a full vial of craft glitter…I looked like a sparkly unicorn for weeks. Also, I use micro beads some times and if you don’t use some thing to catch them when applying them to your project, they can end up on the floor. They feel like painful sand to step on with sensitive feet! I did exactly the same with my clay softener! This one was stupid AND dangerous: I left my latex gloves on while running a sheet of clay through my motorized press. The loose finger tip of my glove got caught in the roller. I was able to yank it out before it reached my finger tip, but yikes! I use the plastic spine that comes on report covers to store my blades. You can cut them to fit any length blade. The cheap, plastic, slide-out pencil boxes are good for storing lots of other tools. Now is a good time to buy because of all the “Back to School” sales. Brilliant idea to protect razor edges!! I have lots of “help” from cats and grandkids, so will be getting me some report folders. Thanks for the tip!! I read somewhere about putting masking or painter’s tape across the safe edge of the cutting blade. I followed through and ta da! Haven’t cut myself yet (knock on wood!)! Today I have two dark blue finger nails because the ink bottle tilted and ran down on the bottle. I picked it up and immediately got very blue fingers. I have managed to clean my fingers using Acetone but under my nails and down the sides of them is permanently dark blue. Last night I went to a concert, never took off my gloves! Promise I will wear latex gloves next time. I teach jewellery making and when we are using polymer clay all my blades have masking tape along one edge. You talked about getting hair caught in the pasta mill, but you also need to pull your hair back into a pony tail or at least with hair pins if you are polishing your cured polymer clay with anything with wheels on it. Like Ginger, it has never happened to me, but back when I was in HS a friend of mine did get her hair caught and a quarter sized area of hair was pulled out. Thank God her hair broke off and so it all grew back. She was too pretty of a girl to have a bald spot in the front of her hair!! I paint the dull edge of my blades with bright nailpolish. Works wonderfully! That has got to be the most brilliant thing I’ve ever heard of. I’m adding that to the article. Thanks for the idea! I also did that but forgot that unbaked clay dissolves nail varnish. Left my blade on a sheet of rolled out white clay only to find I had an unwanted red stripe the next day! I am new by to polymer clay and grateful for these great tips of what not to do. Oh I am sure I will do some of them If not all before i’m done. However I will know i’m In good company when I do. I have so much to learn about it.